Samantha longs for this beautiful doll she saw in the window of Schofield’s Toy Store. It’s made of porcelain and has movable arms and legs. 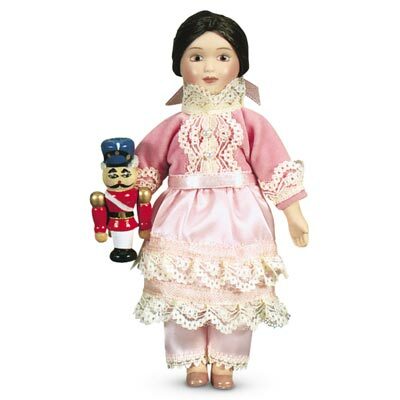 The doll's hair is tied back in a big pink bow that matches her ruffly party dress. 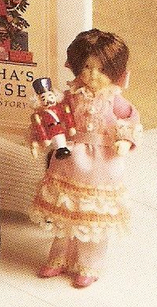 In her arms, she carries a tiny wooden nutcracker. The earliest version of Samantha's doll is shown in the second picture (note the pink vs. tan shoes). It was changed in 1993. The company that produced the doll for American Girl, Kurt S. Adler, also sold it as a Christmas tree ornament, so sometimes you will see the doll sold as AG but with a loop for hanging on her head. Nellie and I like to play dolls.